We are proud to announce that our biggest corporate drumming event this year took place at the Cheltenham Race Course for the Mid Counties Cooperative. Six hundred delegates participated in a mass percussion session using the fabulous Boomwhacker Tubes. What an amazing event it was! Thanks to some the highly skilled production crew, the opening sequence was particularly memorable. Here is an account of how the event 'kicked off': Explosive drumming performance! As all the delegates entered the room after lunch, the lights dimmed and the sound of a solo African drum could be heard. The spot light shone down on a drum soloist who played a stunning introductory riff on his drum. Suddenly the spot light went out and he was gone. Immediatly the spot light shone down on another drum soloist who started playing from the opposite side of the room. The spot light went out and immediatly shone back on the first soloist - they both sounded as though they were talking to each other. As the attention switched back and forth between each soloist, it became clear that they were both getting closer to the stage! Finally as both drummers approached the main aisle, the lights came on and suddenly a full African drumming band created a big sound using bass drums to accompany the soloists - the beat was electrifying! The introductory performance created the perfect mood for what was to come next. African drumming is about involving everybody and the delegates certainly gave their full participation as they clapped to the beats of the drums. But this was just the beginning! What the delegates may not have been expecting was that they were going to be the main act! Underneath each of their tables were packs of Boomwhacker percussion tubes. 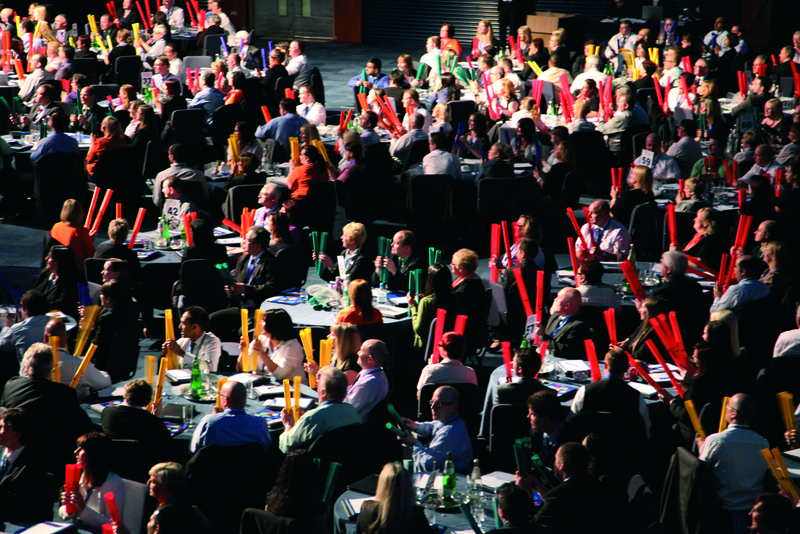 Delegates at each table passed the Boomwhackers around so that within minutes the entire room was filled with the sound of the tubes playing harmonious beats with the drums! It always amazes me how seemlessly a huge number of people can play in time with each other. It is as though the power of everyone playing creates cohesion and support to everyone who participates. Within seconds the entire group of 600 delegates at the conference had managed to find a common pulse with the Boomwhackers - this happened instinctively with very little input from myself! The final sound of the big '600 strong drum orchestra' sounded truly amazing. There were all together six different rhythm parts being played by delegates seated at 76 tables in the room - all were coordinated and each table contributed to a piece of music which had become rich, syncapated, complex and beautiful! Read feedback from Tarra Simmons from Mid Counties Cooperative. Large conference ice breakers such as these are about creating the wow factor, so that everyone remembers the conference for years to come. Such an event provides that all important 'lift' in an organisation - allowing the entire team to be able to see what is possible when everyone fully participates. Unbeatable Energy Ltd would like to thank Tarra Simmons from Mid Counties Cooperative for inviting our input to the conference and for maintaining such excellent dialogue prior to the event. We would also like to thank Dave Hughes and Heartbeat Promotions for providing the superb sound and lighting - their input ensured that the event ran smoothly, and miantained a high level of professionalism.